08 July 2002 – Lawn Party Sandwiches – Southern on Occasion – The Junior League of Cobb – Marietta, Inc., p. 71. My first version of this apparently, ubiquitous recipe, and it is special for me. This is my variation after many different iterations. This (Southern on Occasion) is the first cookbook The Man of the House bought for me. We saw it at Kevin’s Guns and Sporting Goods. I really liked it. But my, then boyfriend, said later that he purchased it for his sister-in-law for Christmas. I understood that because he’s good at gifts, but wasn’t exactly pleased since it was the only copy. Imagined how surprised I was to find it really was for me. He did this way before he was the Man of the House, but it seems fitting that I made something from it for our pre-wedding celebration at the Highland Lake Inn. It was a Monday evening since we were doing everything different – we were married on a Tuesday – the second best day of my life – The Boy has to take just a bit of precedence. But that Monday with just a small group of family and friends was, well, really just so wonderful. This is my new version of the same basic idea – I mean, how can you go wrong with ham and melty cheese? Cut the rolls in half horizontally and keep bottom in one piece, as best as possible. In a small bowl mix butter, Worcestershire sauce, Dijon, and grated onion. Spread evenly on bottom half of rolls. Top with the sliced ham and then sliced cheese. Wrap in foil. At this point you can bake or refrigerate. I think it is best to refrigerate overnight. It makes party day a bit easier to do it a day ahead. Preheat oven to 350 degrees. Bake uncovered for 15 minutes or until cheese melts and rolls are slightly toasty. Well, I’ve been thinking about the super bowl for about two weeks, but didn’t really get down to work on it till yesterday. It’s the first, in my opinion, food event of the year. I suppose that Twelfth Night is technically, but I can’t ever seem to manage that as it is usually the day I go back to that thing I call a job. Jobs get in the way of cooking. Enough said. For me New Year’s is part of the previous year of food planning – Thanksgiving, Chanukah, Christmas, and New Year’s (eve and day), so it doesn’t quite count – ergo – Super Bowl = 1st food event for 2015. The whole idea of “food events” isn’t new*. You can plan your year around them if you choose to do so. It does give me time to experiment and the super bowl, I have to admit is one of my favorites because it is, in our family, appetizers and finger foods (none of them “good” for you) and trying new things and a few standbys that always seem to please. We stay in for the evening and watch – wait for it – the commercials – woo hoo!! I just don’t ever have a dog in this fight – pretty much don’t care who wins. What I would like – though it rarely happens – is a good game, but we can all dream, I suppose. I do prefer Seattle this year, but that’s just because I can’t abide the Patsies. * We shall expand on this food events calendar notion at a latter time, though not much latter or we will miss the next food event. 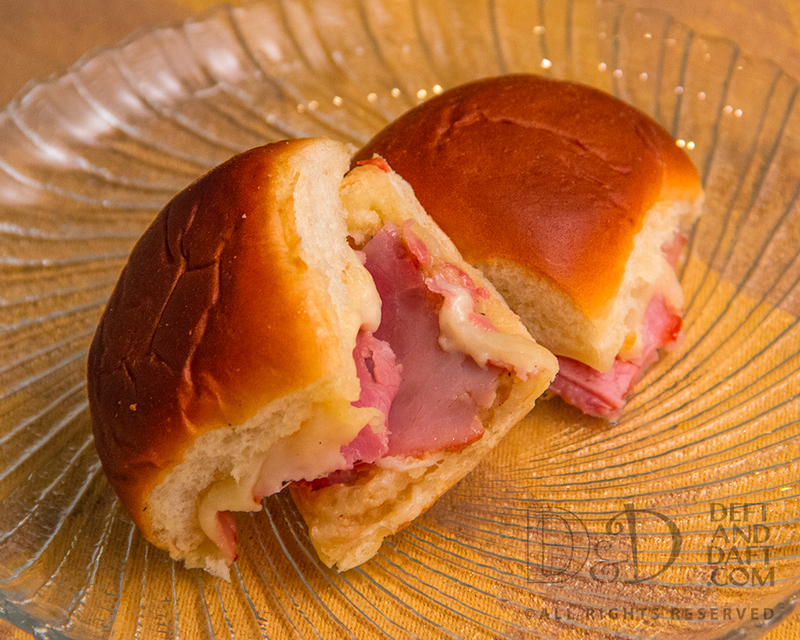 Hawaiian Sliders – this is a take on the ubiquitous ham and swiss appetizer sandwiches. We had the original version (i.e. first version I had seen) at our pre-wedding party in 2002. I’ve read several recipes for this, but have decided that I’m just going to pull the best parts of what I’ve seen and make it work. I am making my own recipe based on what works for us. More on this after the game. Sun-dried tomato Artichoke Buttons – I’ve been thinking of making this for ages, and I’m finally going to do it. I may eat them all myself (over days, of course), but I think it has potential. But I’m winging it again – no artichoke bottoms at my Publix. Still the flavors sound good, and I’ve made my own pesto as usual – super easy and really good. I’m sure it will work. Hot Reuben Dip – will do a half recipe as I made it in 2011 for Christmas Eve and it was way to much for our small group. But the flavors – really good. If you like a reuben, that is. Have thin rye bread to toast for it. Thomas’ California French Bread – a recipe I’ve had so long (pre 1990’s) that I have no idea where it comes from, but I have googled it and nothing comes up. Is that strange or cool? I’m going for cool. Not sure who Thomas is, but in my opinion – he is a god. And some sort of cheese cracker – still debating on that. I’m thinking Rosemary Cheddar crackers from a Foster’s Market recipe. I sure do miss the NC triangle. Foster’s Market. Southern Season, UNC-Chapel Hill. They have fall there – sigh. But they also have ice storms, sort of like winter hurricanes. Any way, bring on the football, um, commercials. Or whatever.